Situated between Geneva and Mont Blanc, the traditional Savoy resort of Morzine and its modern neighbor Avoriaz is a unique combination of the Alpine atmosphere and the best that is found in many ski resorts. The location of the village inside the gorge, closed from the wind by forest slopes, makes it possible to skiing comfortably here even in bad weather conditions. The resort is ideal for families with children, beginners, those who prefer large areas of skiing, for a budget holiday. Morzine is an Alpine town with an old center in the traditional Savoyard style. Here, buildings are not built above the church, which allows preserving the historical appearance of Morzine. The slopes of Morzine are diverse and they approach directly to the hotels. From Morzine it is easy to get into the vast interesting skiing region, starting in Avoriaz (800 m above Morzine). Today Morzine is a modern ski resort that has preserved the charm of a traditional alpine village. Morzine is a commune in the department of Haute-Savoie in the Rhône-Alpes region in the east of France with a population of more than 3,000 people. This is one of the 12 resorts of the international ski area Port du Soleil. Morzine means "border region" in Latin. The history of Morzine begins in the distant 1181 from a small manor near the Cistercian monastery. Favorable weather conditions, fertile soil and diligence of monks - these are the main trump cards for the development and long history of Morzine. Today the combination of picturesque slopes with buildings of houses and hotels, famous alpine sloping roofs, built in classical Tyrolean style, distinguish this resort from the others. The atmosphere of the city is truly French, it's nice to just walk along the streets, sit in a bar or restaurant, talk to the locals. 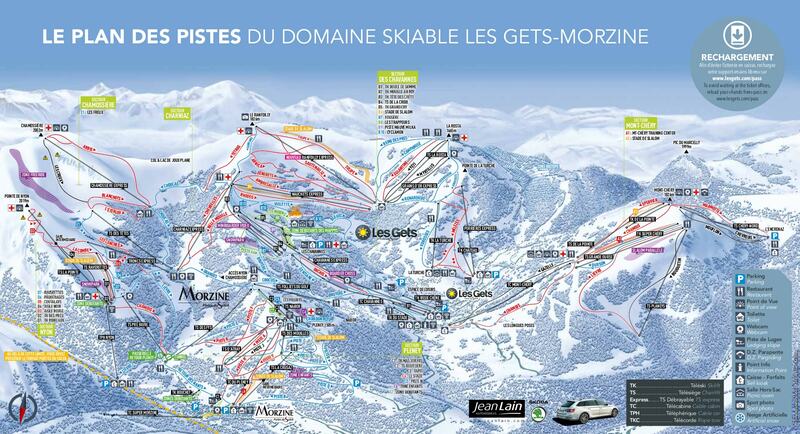 The time of transfer to Morzine ski resort from these airports and train stations is approximate because the transfer time could be impacted by traffic and weather conditions. Our clients already know that the most profitable rates for all transfer services, which Apls2Alps provides, will be available at any time. Even if you are planning your holiday in the high season, you still can be sure of the most beneficial transfer price. Alps2Alps never overstate our prices at any time and by any reason. But we always recommend our customers to make a transfer booking as early as possible in order to get access to the best deals. You should know that travelling outside of the peak season or at working days (from Monday to Friday) typically leads to the greatest savings. Apls2Alps provides significant discounts (up to 60%) for mid-week transfers. Your transfer price will also depend on the availability of the car, the transfer schedule, the use of the vehicle and other costs like tolls and airport parking charges. If you have any additional requirements, please contact us directly so that we can discuss together your future trip. As in any large region, there are many routes around Morzine of varying complexity - from gently sloping forest to more impressive reds and blacks. Fans of freeride and skiing "from dawn to dusk" should definitely leave their tracks around Avoriaz and on the Swiss side of the skiing area. For freeriders down from this amazing resort goes three kilometres Snowzone, where you can, without fear of avalanches, frolic in virgin lands. The well-developed infrastructure of the resort will not allow boredom for either adults or children. For fans of active nightlife there are several nightclubs. For children in the main square, the tourist office organizes weekly contests and quizzes, and there are also attractions for toddlers. In Morzine, a lively evening life: Nightclubs, bowling, an excellent ice rink, where hockey matches and performances of figure skaters are regularly held, more than thirty restaurants, or if you fancy a night in your chalet you can get food delivery in Morzine! The Morzine Ski School is one of the oldest divisions of the ESF (French Ski School). Today the resort employs 120 ESF instructors, and in peak seasons their number increases to 160. Morzine is a certified family resort, which means that families with children are offered special programs, discounts, entertainment for any age, the resort has enough professionals to work with children. Alps2Alps is a team of professionals, and we know what exactly every ski traveller expects from the transfer company. Arriving on time, in comfort, in a friendly atmosphere and paying the lowest price for that. Right? Don’t delay booking your shuttle to the ski resort, because during the peak season the prices will be much higher. So, it would be better to order your transfer in advance to get the biggest economy of money. Just give a call to our customer service managers or fill out the online request form. Let your ski holiday start the best way here, in Alps2Alps, in one click!